Snow removal operations are underway in Kingston. The university is open. The university received between 5-10 cm of snow overnight. Snow removal is underway. The university remains open. Everyone travelling in Kingston is reminded to allow extra time to travel safely. Marianne Alarie scored her 1,000th point as a Gael as the Queen’s women’s basketball team (11-7) defeated the Laurentian Voyageurs (6-12) 72-46 on Saturday night, adding to the Bell Let’s Talk events. This Saturday marked the Queen’s Gaels annual Bell Let’s Talk games as women’s and men’s volleyball, women’s and men’s basketball and men’s hockey hosted special Mental Health Awareness-themed events throughout the day. Early in the second quarter, Alarie made a basket which lifted her to 1,001 career points in the Tricolour. She finished the game with 13 points and now sits at 1,009. Alarie joins Gaels greats Liz Boag (1,055) Jenny Wright (1,167) and Brittany Moore (1,652) in the 1,000-point club. The Gaels started off strong and built up as 23-4 lead after the first quarter and never looked back. Leading the way for the Gaels was Veronika Lavergne with 15 points and Sophie de Goede with nine rebounds. On Friday, the Gaels defeated the Nipissing Lakers (3-14) 95-69. It was all Gaels in the opening quarter and built up as 25-13 lead. The Lakers picked up their game in the second quarter and closed to within six at one point before the Gaels reclaimed the momentum to take a comfortable 46-32 lead into the break. The Gaels kept up the pressure, scoring at will and wrapped up with 95 points. Leading the way for the Gaels was Veronika Lavergne with 21 points while Maddie Morris had rebounds. The Queen’s Gaels men’s basketball team (9-9) fell to the Laurentian Voyageurs (10-8) 85-72 on Saturday night at the ARC. The visiting Voyageurs got the jump on the Gaels early on, starting the game on a 9-0 run and storming away to a 17-8 lead. The Gaels battled back but were unable to sustain a scoring run and trailed 44-26 at the half. The Voyageurs controlled the rest of the game and the Gaels were never able to cut the lead down to single digits. On Friday night the Gaels defeated the Nipissing Lakers (2-15) 84-75 in overtime. After the Lakers finished the first quarter with a 15-14 lead the Gaels posted a solid second quarter to move ahead 32-27 at the half. However, the Lakers would push back in the third before the Gaels regained their balance, and the score was tied 66-66 at the end of regulation. In overtime, an early Quinton Gray three-point shot sparked a 7-0 run for the Gaels, who took a commanding 73-66 lead and held on for the win. The Queen’s Gaels men’s volleyball team (10-3) swept the Ryerson Rams (9-4) at home on Sunday, 25-23, 25-23 and 25-20. The Gaels got off to a hot start in the first set and held on, but had to battle back to edge the Rams in the second. In the third set the Gaels took an early seven-point lead and held off the Rams for the straight set victory. Zac Hutcheson finished with 18 kills for the Gaels. On Saturday, the Gaels topped the Toronto Varsity Blues (8-5) in four sets, 25-17, 22-25, 25-18 and 25-22. After cruising to a win in the first set the Gaels fell behind early in the second and were unable to close the gap against the Varsity Blues. However, Queen’s would regain the momentum with a strong third set before edging Toronto to close out the match after being tied at 22-22. Hutcheson led again with 15 kills. The Queen’s Gaels women’s volleyball team (7-5) won in five-sets against the No. 8 Toronto Varsity Blues (8-4) on Sunday, 25-21, 20-25, 21-25, 25-23 and 15-9. After splitting the first two sets, the visitors edged ahead by taking the third set. With their backs against the wall the Gaels edged past the Varsity Blues with some solid play to tie up the match. In the fifth and deciding set, the Gaels grabbed an early lead and key kills by Julia Wiercigroch, Isabelle Korchinski and Caroline Livingston helped close out the win. On Sunday the Gaels (7-6) were swept in three sets by the Ryerson Rams (12-1), 25-18, 25-20 and 25-20. The Gaels got off to a rocky start and were unable to gain much momentum in the first set. Ryerson continued to put on the pressure in the second, and while the Gaels rallied to close an eight-point lead, Ryerson was able to hold on. In the third set, the teams were tied at 12-12 but the high-powered Rams were able to pull away and close out the match. Arielle Palermo and Caroline Livingston both had eight kills. The No. 9 Queen’s Gaels men’s hockey team (17-7-0) needed the shootout but were able to pick up an important two points with a 4-3 win over the Concordia Stingers (14-8-2). The Gaels jumped out to an early 2-0 lead on goals by Jared Bethune and Slater Doggett in the opening three minutes. The Stingers struck back in the second but Alex Row made it 3-1 just 21 seconds later. The Gaels weren't able to hold on to the lead as the Stingers scored two in the third period. Overtime solved nothing but Doggett and Francesco Vilardi were able to convert in the shootout while Justin Fazio made a pair of saves. On Friday, the Gaels scored a 3-1 victory over the Laurentian Voyageurs (6-15-1). Eric Margo and Slater Doggett scored in the second period before the Voyageurs closed the gap to make it 2-1. That was the only puck to make it past Justin Fazio and Liam Dunda added an empty-netter. The Queen’s Gaels women’s hockey team (11-8-0) fell to the Guelph Gryphons (14-2-1) by a score of 4-1 on Sunday. Following a postponed matchup with the York Lions on Saturday, the Gaels traveled to Guelph on Sunday to take on the OUA-leading Gryphons. Guelph scored a goal in each of the opening periods before Caroline DeBruin got the Gaels on the board in the third. But the Gryphons restored the lead and added a late empty-netter to seal the win. Upcoming panel event for common reading program focuses on what it means to be a Queen’s student. Queen's Reads is a common reading program that aims to engage the Queen's community in a dialogue. This year's novel is Scarborough, by Catherine Hernandez. 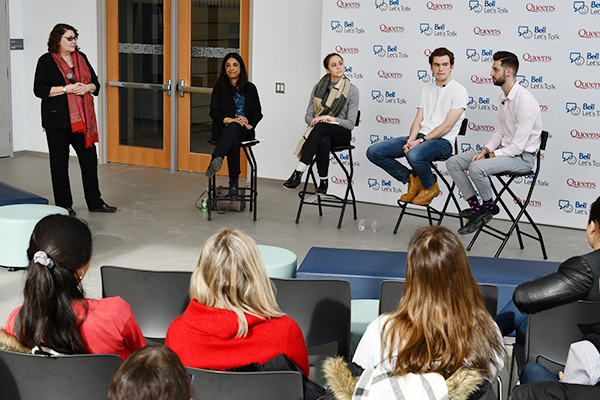 Queen’s Reads brings the student voice to the foreground in its second event of 2018-19 – a panel that will discuss what it means to be a Queen’s student. This year’s Queen’s Reads novel, Scarborough, by Catherine Hernandez, grapples with the concept of identity within a culturally diverse Scarborough neighbourhood. The event on Jan. 31 will provide students with an opportunity to discuss this theme and apply it to their own experiences at Queen’s. Students, faculty members, and staff are invited to participate on Thursday, Jan. 31 at 7 pm in Wallace Hall in the John Deutsch University Centre. There will be a reflection activity, followed by the panel discussion and a question-and-answer period. Free copies of the novel are available for all Queen’s students. Everyone is welcome to attend, even if they haven’t read the book. Learn more about Queen’s Reads and upcoming events, including an Empathetic Imagining workshop being held in March. Thousands of Queen’s students will have the opportunity to help inform the university’s health and wellness services and programs, starting on Jan. 28. A random selection of 6,000 undergraduate students and 1,000 graduate students at Queen’s will receive email invitations from Vice-Provost and Dean of Student Affairs Ann Tierney and Rector Alex Da Silva, to participate in the National College Health Assessment (NCHA) survey of student health and wellness. The online survey, which takes approximately 20 minutes, will remain open until Feb. 15. Participation is confidential and voluntary. Students who complete the survey will receive $6 in flex dollars which can be used at any hospitality services outlet on campus. Queen’s has previously participated in the survey in 2013 and 2016. Results prompted the development of several initiatives, including Athletics and Recreation’s ‘Get Your 150’ campaign, which encourages Queen’s community members to complete 150 minutes of activity each week, as well as peer-led health promotion workshops on the importance of sleep, managing back pain and how to ‘practice safe tech’. Results from recent surveys will also help to inform the Campus Wellness Project which is working to develop a framework to encourage and support a culture of well-being for all who learn and work at Queen’s. More than 30 post-secondary institutions across Canada are participating in the survey, which will also provide national and provincial statistics. Staff and faculty members who receive questions from students or want more information about the survey can contact Beth Blackett, Health Promotion Coordinator, Student Wellness Services. Principal Woolf addresses city council on challenges, opportunities, and progress on Queen’s-Kingston initiatives. Principal Daniel Woolf returned to Kingston city council on Tuesday, Jan. 22 to deliver an update on a number of initiatives underway at the university. The address also provided an opportunity for Principal Woolf to speak about the challenges and successes of the town-gown relationship during his two terms, as well as to highlight to city council the opportunities that lay ahead. Highlights of Principal Woolf’s remarks included an acknowledgement of the many partnerships formed between the university and the City of Kingston in recent years – including the Kingston Immigration Partnership, and the Memorandum of Understanding on innovation and talent retention. Principal Woolf also noted that the relationship has not been without its challenges, and pointed to the University District Safety Initiative as an example of joint efforts to tell students and the community that unlawful behaviour carries consequences. The current city council term began on Dec. 1, 2018, and features four first-term councilors – Simon Chapelle, Wayne Hill, Bridget Doherty, and Robert Kiley – in addition to eight returning councilors and second-term mayor, Bryan Paterson. Principal Woolf’s term concludes on June 30, 2019. Patrick Deane has been appointed as the 21st principal and vice-chancellor of Queen’s. Queen’s faculty can now apply for funding designed to incorporate more Indigenous voices and perspectives into the classroom. Part of a two-year pilot effort, the new Indigenous Initiatives Visitorship Fund (IIVF) will provide financial support to faculty seeking to invite Indigenous knowledge keepers, elders, and community representatives to be guest speakers. All faculty can apply for one of five yearly grants of $2,000 to cover speaker fees, room and equipment rentals, travel expenses, meals, and tokens of appreciation. The funding does not cover equipment purchases, charitable donations or wages, or expenses in support of individuals attending a visitor’s lecture. A selection committee will assess applications based on suitability of the speaker or event, and the impact the speaker’s visit would have on advancing reconciliation and promoting Indigenous ways of knowing. “The IIVF will help promote an understanding of Indigenous histories, perspectives, and contemporary issues within the university community,” says Ms. Hill. “It’s about building relationships with Indigenous communities, organizations, and individuals to foster mutually beneficial collaborations that can boost Indigenous education opportunities and research partnerships. Applications for funding will be accepted once per term, with the Winter Term deadline falling on Friday, Feb. 15, 2019, and the Fall Term deadline on Tuesday, Oct. 1, 2019. For more details on the funding, and how to apply, visit the Indigenous Initiatives Visitorship Fund information form or contact the Office of Indigenous Initiatives. The Office of Indigenous Initiatives and the Deputy Provost (Academic Operations and Inclusion) will review the IIVF program after the two-year pilot period. Information on the full complement of Indigenous Support on campus, visit the Inclusive Queen’s website. It was an opportunity to talk about mental health at Queen’s University on Tuesday. Emceed by Rector Alex Da Silva, the event brought together a panel featuring Arunima Khanna, Cross-Cultural Counsellor with Student Wellness Services, as well as students Constantina Venetis, Jake Bradshaw, and Tom Ellison, who all discussed their own experiences with mental health and answered questions from the audience. The talk is one of a number of events being held leading up to Bell Let’s Talk Day on Wednesday, Jan. 30. Other events include #BellLetsTalk games on Saturday, Jan. 26 for the men’s and women’s basketball and volleyball teams as well as the men’s hockey team. Elsewhere on campus, Queen’s Residence Life will host a Bell Let’s Talk booth event at Leonard Dining Hall from 11:30 am to 2 pm. Later in the day Residence Life will host a film viewing and open discussion on mental health at Victoria Hall A011 from 6:30 pm to 9 pm, which is open to students living in residence. Annual CUBA conference helping universities to better prepare for the changing world of work. Queen’s University is preparing to host the Canadian University Boards Association (CUBA) conference in May with a theme this year of “A World of Opportunities”. Each year the conference focuses on pivotal issues affecting Canadian universities. The purpose of the annual conference is to educate participants, who are members of university secretariat offices or university boards across the country, on best practices in university governance, and on national, international and provincial trends affecting post-secondary institutions. The conference also provides opportunities for networking among individuals responsible for the leadership and operations of university governance boards and senates. This year the Kingston event looks at how universities can adapt to a new world of work and changing workforce trends which put pressure on universities to prepare their students. “The opportunity to share experiences with and learn from others is critical to ensure that a university remains equipped to manage current challenges, but also emerging issues that others are experiencing and to learn about strategies and tactics being employed to meet them,” says Lon Knox, University Secretary at Queen’s. The conference is expected to attract over 100 attendees over three days in Kingston and includes a number of keynote addresses and discussion sessions. One of the keynotes this year is being presented by John Stackhouse, member of Queen’s University Board of Trustees and senior vice-president, Office of the CEO at Royal Bank of Canada. For the keynote, Stackhouse is focusing on how we can prepare Canadian youth for the workplace of the future. Another highlight of the conference is a presentation by Queen’s alumnus Ali Velshi. Velshi has worked as chief business correspondent for CNN and as anchor of CNN’s Your Money, as well as serving as co-host of CNN International's weekday business show World Business Today. He currently serves as senior economic and business correspondent for NBC News and co-anchor with Stephanie Ruhle of Velshi & Ruhle on MSNBC. At the conference, he will be sitting down in a fireside chat format to discuss the future of internationalization at Canadian universities with Phil Glennie, Communications & Partnerships Manager at Academica Group. See the video here. For more information on the conference and the full schedule, visit the website. Campus events to celebrate annual mental health awareness day. Leading up to Bell Let’s Talk day on Jan. 30, Queen’s students, staff, and faculty will engage in a variety of events aimed at continuing a campus-wide conversation on mental health. On Tuesday, Jan. 22, Dr. Stuart will facilitate Let’s Talk Mental Health – an open conversation with students about mental health on campus. Held in the Rose Innovation Hub at the newly-opened Mitchell Hall, the free session will provide space for participants to share their own experiences with mental health, and hear about the latest in mental health research. The Queen’s Gaels will also host #BellLetsTalk games to promote mental health awareness on Saturday, Jan. 26. The women’s and men’s volleyball and basketball teams as well as the men’s hockey team will dedicate the day’s game to the cause, encouraging fans to wear complimentary, blue Bell Let’s Talk toques to show their support. Mental health awareness volunteers will be on hand, and there will be a mental health banner for fans to sign, and special in-game promotions and contests. On Bell Let’s Talk day, booths will be set up in both the Mitchell Hall atrium and the Queen’s Centre to share information about mental health resources on campus, including tips on how to care for your own mental health, as well as swag giveaways and a photobooth. Running from 11 am to 2 pm, the booths are a collaboration between Queen’s Health Promotion and its Peer Health Educators, Athletics and Recreation’s Get Your 150 Ambassadors, the Office of the Vice-Provost and Dean of Student Affairs, and the Mental Health Awareness Committee. Queen’s Residence Life will be hosting a Bell Let’s Talk booth event at Leonard Dining Hall on Wednesday, Jan. 30 from 11:30 am to 2 pm. There will be variety of resources available for students, including opportunities to connect with the campus’ registered dietitian from Hospitality Services to discuss mental health and nutrition, as well as with Peer Health Educators to gain tips on increasing your overall well-being. In the evening, Residence Life will also host a film viewing and open discussion on mental health at Victoria Hall A011 from 6:30 pm to 9 pm – open to students living in residence. Students interested in mental health information and services can visit the Student Wellness Services website, and staff can find more information about related programs on the Human Resources page. From Jan. 28 to Feb. 15, 6,000 Queen’s students will be randomly selected to complete a Student Health and Wellness Survey administered by the National College Health Association (NCHA). The survey, issued to more than two dozen Canadian post-secondary institutions will seek to better understand student health so academic and personal supports, including mental health support, can continue to grow. Learn more about the survey.